Summon your USApyon minion. A Yo-kai who aims for the moon. 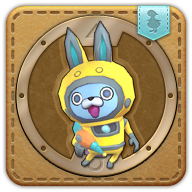 A Yo-kai from across the sea, USApyon hopes to someday venture into space. He uses Vader mode when he is angry.